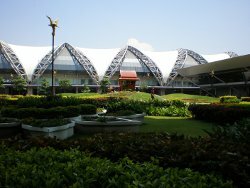 I often get asked to recommend hotels near Bangkok International Airport (Suvarnabhumi). The answer I usually give is that people shouldn’t rule out staying in other areas of Bangkok, such as Sukhumvit, which can usually be reached in less than an hour from the airport. However, I’m also well aware that traffic can be notoriously bad in Bangkok, especially during the morning and evening rush hours when a 45 minute journey can turn into 2 hours or more. For those that don’t want to take their chances with the Bangkok traffic and insist on being close to the international airport at Suvarnabhumi, I’ve compiled a list of suggested accommodation. All of these hotels are within 15 minutes drive from Bangkok Suvarnabhumi airport. Meter taxis are available from the airport (expect to pay minimum of 150 Baht plus 50 Baht airport pick-up surcharge). Alternatively, most of the hotels provide a pick-up and drop-off service to the airport which may work out more convenient especially if you are not familiar with the layout of Bangkok airport. Price for this varies, but is approximately 150 to 250 Baht each way. Of all the hotels listed here the 4-star Novotel is the closest to the airport and is also the most expensive. The Novotel is a 10 minute walk from Bangkok’s international airport. There is also a 24-hour shuttle bus in operation which runs at approximate 10-minute intervals. Guests can book a daytime stay (ranging from 4 hours up) as well as overnight stays. Expect to pay at least 3,000 Baht for a short 4-hour daytime stay and around 5,000 Baht for an overnight stay. Less than 10 minutes from the airport with prices around 1,000 Baht. A 15 minute drive from the airport with room prices from 1,000 Baht. Airport transfers available at extra cost. Queen’s Garden Resort is around 10 minutes drive from Suvarnabhumi airport. Day rooms and overnight stays are available with prices from 900 Baht. The hotel operates airport transfers (not included in room price) and offers 24-hour reception for convenient check-in/out. A 6-minute drive from the airport. Prices from around 800 Baht. I’ve now stayed here a number of times and for all-round value this is my number one choice.